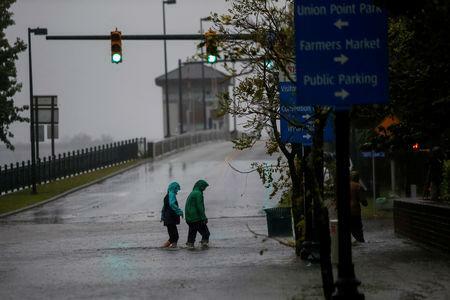 (Reuters) - U.S. Southeast power companies said over 634,000 homes and businesses located mostly in North Carolina and South Carolina were without power on Friday after Hurricane Florence hit the coast. Florence crashed into the Carolinas on Friday with 90-mph (144 kph) winds, torrential rains and a powerful storm surge before slowing to a pace that meant it would plague the area with days of flooding. Duke Energy Corp, the biggest utility in the area with over 4 million customers, estimated the storm could cause between 1 million and 3 million outages. Restoring power to all customers could take weeks, it said. Duke said it had more than 20,000 personnel ready to start fixing outages as soon as conditions allowed, including over 8,000 from Duke's Carolinas utilities, 1,700 from the Midwest, 1,200 from Florida and 9,400 from other utilities.